Join Lands' End and 5 Minutes for Mom for the Ultimate Back-to-School Twitter Party! Lands' End hosts will be available to answer back-to-school shopping questions and the party will feature more than 20 product giveaways from co-hosts, 5 Minutes for Mom. Save the date and log-on to Twitter for an evening of shopping tips, socializing and great giveaways! I just commented on this at Kathleen's. ;) Have a wonderful time! 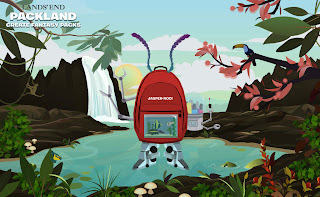 my kids used Land's End backpacks for years and years until High School book issues came up. The lockers are seriously small, about roomy enough for shoes and the school is enormous. Anyway, long boring story short, they have to carry their stuff everywhere. My point? I have none. lol I love Land's End.